Last Saturday I attended the launch of Kama Jewellery's latest diamond collection hosted by the lovely Parimita Chakravorty of MumbaiGloss. The invite said, A #DateWithDiamonds. Now who could refuse that? The event was organized to launch the new and yet to be named diamond collection by @Kama Jewellery. And the best part, they decided to let the bloggers name it. How interesting is that!!! It was such a fun and informative evening. We browsed through the Kama Boutique in Mumbai, where we experienced Kama's detailed and fine craftsmanship first hand. We visited the Kama Diamond Factory, where we witnessed the step by step process involved in the crafting of that one perfect piece of your Diamond Jewellery. And then the unveiling of the new collection. The new collection was straight out of a dream. The exclusive jewellery featuring Asschers, Emeralds and Cushion Cut Diamonds set in 18 carat white and yellow gold, spelled old world charm meets modern glamour. The use of cushion cuts diamonds gives the jewellery a vintage appeal while the seamless assimilation of yellow diamonds in this collection give it a modern and classy twist. who is content yet demanding. I perceive this collection as a beautiful marriage of contradictions. Indrani - For The Goddess In You. Indrani, The Goddess of endless beauty and jealousy. The immortal, independent daughter of an Asura and beautiful wife of the King of Gods - Indra, Indrani was a real woman. She was not always forgiving and benevolent as you would expect a Goddess to be. She was strong, powerful and did not shy away from portraying her dark side. In fact she took utmost pride in it. It is her contradicting nature and features that make her someone you can empathize with. The USP of the collection is its versatility. Wear it on a saree or with a little back dress, be ready to make some heads turn and invite some green eyes. The collection has something for everyone... Something for a corporate meeting, a high tea party or a wedding reception. The collection consists of elaborate designs for the special occasions as well as classy minimalist designs for your everyday wear. Now, some of my favourite picks from the collection. Cushion Cut Diamond necklace on a saree...Need I say more??? 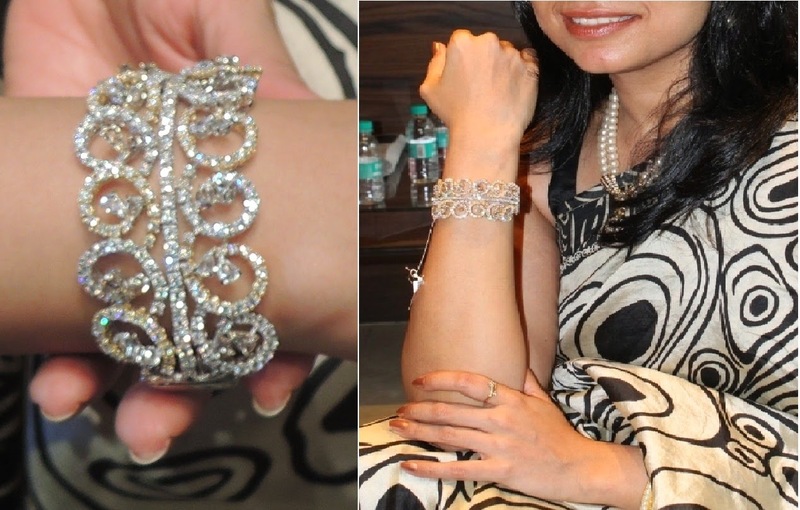 Flaunting some serious arm candy...Perfect for High Tea Parties. 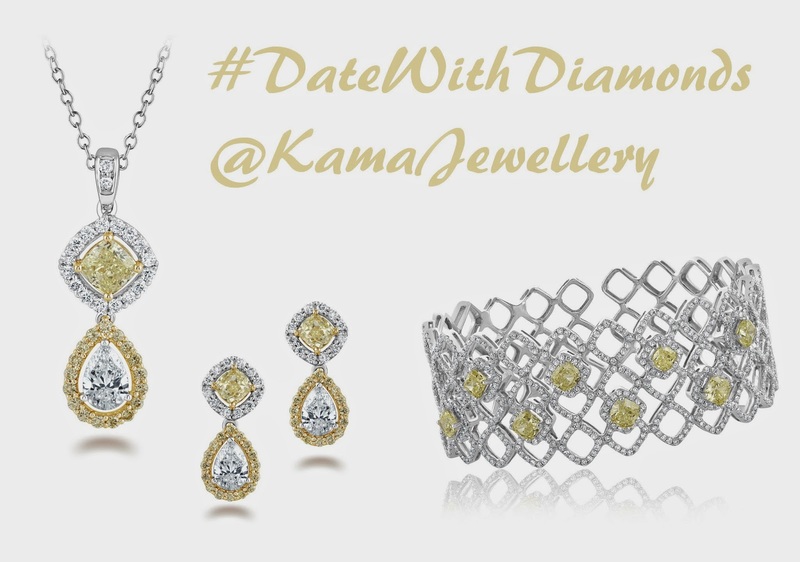 For more details about @KamaJewellery and the collection click here. You can also connect with Kama on Facebook and Twitter. Sure had a lot of fun at the meet, Aditi. I am in love with the cushion cut necklace...... Pretty! gorgeous pieces! hey aditi where i mumbai do you stay??? i stay in goregoan. do you want to catch up sometime?? The cushion cut diamond necklace is beautiful!